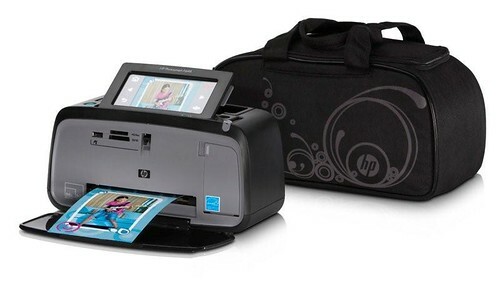 Win an HP Photosmart A646 Compact Photo Printer! You may remember that a few months ago I participated in a blogger relations program by Hill & Knowlton on behalf of their client Hewlett Packard Canada. I reviewed their HP Photosmart Premium All-In-One C309 (part 1 and part 2). Quite frankly, I wasn’t expecting anything (since I already kept the printer, as HP Canada indicated I could do – I could have also returned it, but it’s proven very useful for my day-to-day activities). But then I got an email from Linda North indicating that they were giving me an HP PhotoSmart A646 Compact photo-printer to give away on my site. I found this quite a generous offer, and I love giving away stuff on my site. As I said before, I don’t do this for money or the fame, but if people read my site and I can provide my readers with free stuff, all the better. So, I gladly accepted. They couriered the printer to me and I finally got an opportunity to write about it. I found the environmental features of the photo printer very appealing. From their communications, I found out that this new compact printer has some great environmental features. It’s shipped in a reusable tote bag made from recycled plastics and its body is made with more than 32 per cent recycled plastic material. You can enter the contest just dropping a comment on this post. I’ll draw a winner on Thursday November 5th, 2009. Feel free to re-tweet, share, and spread the word. And thanks to H&K and HP Canada for giving me a chance to give something away for my readers! The printer I’m giving away to my readers is provided by Hewlett Packard Canada as a token of appreciation for participating in reviewing the HP Premium C309 as part of a blogger relations program by Hill and Knowlton on behalf of their client HP Canada. In any review I write, I retain editorial control at all times and thus getting a free item does not guarantee a favorable review. Should you have any questions or should your company want to send me a product for review, feel free to contact me via e-mail through my contact form. Looks nice. I had a much earlier version of this printer & it worked great – press the buttons and out pops a pretty good pic… no fuss. My only quibble with the old printer was the enormous quantity of software that it installed and how it kept trying to override my editing decisions. But, having left Windows behind a long time ago, I’m really pleased to see that HP officially support Linux for this printer. Way to go HP! Actually, I wonder what proportion of compact photo printers are used tethered to a PC and what proportion are used free-standing at parties… pop in your memory card and walk away with a print? That’d be cool to have! I could definitely use a photo printer for a number of things I’ve been working on. Plus, look at how cute it is! I’m glad to see the HP officially supports Linux (unlike Kodak) since I too left the Microsoft bandwagon a few years ago. Plus the small size makes it a bit more portable than other photo printers. That’s adorable! I’ve got a big HP all-in-one at home, and it’s been great to me, this looks like a lovely and useful little addition to the desk! This is an adorable printer– I love HP products, so I’m sure it’s great quality! Wow,quality comes in a small package.This is a great improvement for printers and of course,it is a HP. Im a new follower and since I don’t have a printer I thought I’d say hi and enter the contest! Nice of H&K and HP to give you a printer to give away! Aah, as if we needed a reason to visit your awesome blog! Freebies are always nice though! That’s a cool photo printer! Oooh, another chance to win one of these precious little gems. Fingers crossed. Ooh, another entry by the Schweber family. Aiden is too cute, we need to share pics! cool giveaway and this would be perfect since my last printer was thrown out accidentally by movers. good luck everyone! The printer looks pretty sweet. I’ve been using an HP photoprinter myself for a while now and have enjoyed every minute I’ve used it. Mind you, it’s pretty old skool compared to that one. How convenient… my printer just died a horrible death! This is a great looking printer and definitely handy for printing pics for Mum in Ontario — she hates the digital kind!